I was going to write about this anyway, then I saw a bonus where I could obtain a free license of WebCam Max software by simply providing a review, so I figured why not? 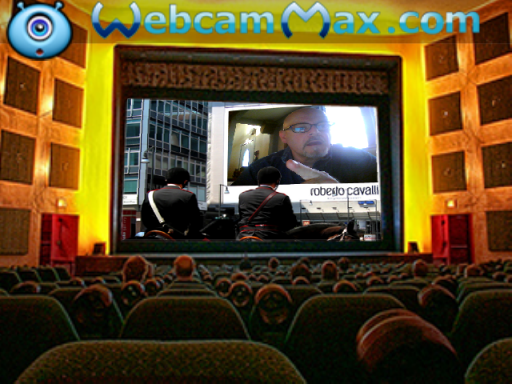 If you visit the main WebCam Max site you will see that this software is used in conjunction with a Web Cam to provide all sorts of wild and zany effects. These are quite fun and I find that they help me achieve some very interesting and entertaining still photos that I capture and use for my ever changing (and ever growing) collection of Facebook profile pictures. The effects are added in real time as you capture with no post editing required. In my testing, it seems to work fine with Skype video. Not so well when recording using Camtasia Studio. The computer slowed to a crawl when recording with Camtasia and pointing at the WebCam Max for the additional video. In my own experience the software is initially somewhat tricksy to download. You are directed from the WebCam Max site to cnet’s Download.com. Perhaps it was a fluke and it doesn’t happen often, but it took me perhaps five attempts to coax the actual download to occur. Once downloaded, however, installation was a breeze. If you wish to try it out, visit the WebCam Max site by clicking here. Once you start the application you see a splash screen. From there you have to choose to Try or to Buy. Your call here on whether to try or to buy. Personally, I opt to try as I like to put things through their paces before an actual purchase ensues. Okay, so now you should be in. The software seems pretty intuitive. I suppose the developers of this software felt it was so intuitive that it didn’t really warrant an official help file. And as any of you reading my blog know, my roots are in help file development. So it’s only natural that I would be the one in search of a help file. However, my reasons for wanting a help file go beyond just wanting to know if one is supplied. I have a question that would possibly be found in the help. So I did fire the question off to the support area for WebCam Max. Operation is pretty straightforward. You choose an effect and suddenly see it appear. The really cool aspect is that you can apply multiple effects. For example, one effect shows your image as if you are in a rear view mirror. Another shows your image as if you are in a stadium or on a billboard. And if using multiple effects, you can create some interesting looking situations where you look as if you are on a rear view mirror on a billboard. Assuming I’m able to accomplish my own goal, it would seem that for me the software will be well worth the price of admission. But speaking of the price for admission, I’d be lying if I didn’t also say that in my own opinion, the pricing structure is a bit on the questionable side. I have to admit that when I purchase software, I really dislike paying what amounts to a “usage fee” for a specific time period. It seems the structure on WebCam Max allows for “renting” the software for one year at one rate, or purchasing a lifetime license at a higher rate. Until you choose to upgrade to a paid version, you have to accept the WebCam Max logo plastered on what you create. And to me that’s perfectly reasonable and expected. After all, creating and maintaining software costs money. And unless you are just a hobbyist, you won’t stay in business long just giving it away at no charge. From what I see of things, once you pony up and upgrade, you get access to 2,000 or so additional effects. I’m crossing my fingers here and really hoping one of the effects allows creating a transparent background so I can become a floating “Talking Head” to superimpose on web pages or other videos. As I stated earlier, I’d love to see some form of help that describes various aspects. I’d also like to see a teaser page that presents all the additional effects available. This would go a long way toward knowing if the software will work for you. Another thing that would be nice (and possibly included in a help system) is the ability to use your own backgrounds and effects. Sort of an “Effects construction kit” and it would include the ability to share effects with other WebCam Max users. Overall, it’s a neat little piece of software. But this carries a warning. I find that neat little pieces of software like this tend to attract attention from very large companies such as Microsoft and Adobe. And once they get acquired, these larger companies tend to extract the bits that make sense to them to roll into their own products, then discard the original product and its user base. And that’s very unfortunate. This entry was posted on April 8, 2011 at 4:21 PM and is filed under General Musings, Software Tip. You can follow any responses to this entry through the RSS 2.0 feed. You can leave a response, or trackback from your own site.